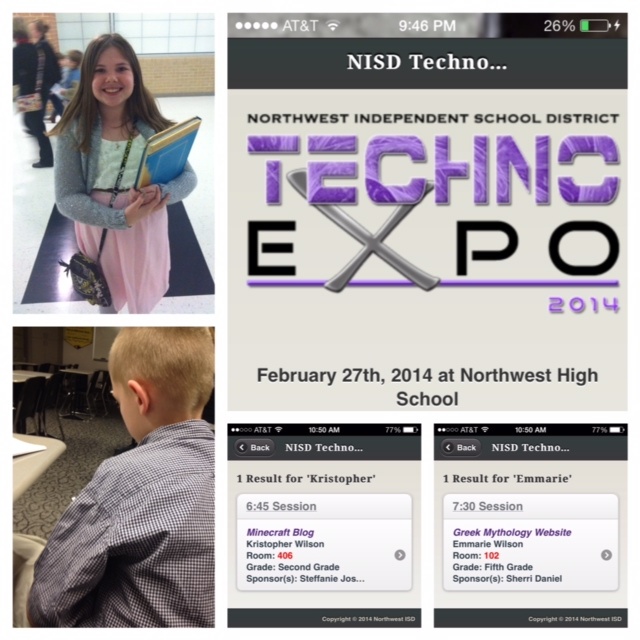 Recently my district and specifically the Instructional Technology Department, which I am a team member, hosted a Student Technology Showcase event called TechnoExpo. Over 1,000 products and 500+ presentations took place at this even on February 27, 2014. Both Embug and Kritterman presented. Both of their products stemmed from our summer venture with Genius Hour– Summer Camp Style a.k.a. Mom’s plan to keep us challenged and learning. Kritterman struggles with writing. He’s wiz at math, loves science experiments and inquiries, powers through thick fantasy chapter books with unparallelled speed, but give him the task of writing more than a sentence and he is like a 4-wheeler in a freshly plowed field after 2 days of rain. So when Genius Hour began and he chose to explore his passion for Minecraft, I saw the perfect opportunity to marry a passion with a personal challenge. How would he take his passion and recast it to fill a need for others? Through blogging. He still struggles with the writing, but he loves to see the “traffic” on his blog. He has since learned to do YouTube tutorials using Screencast-o-matic on Minecraft and loves it. We are working on a trade off between YouTube posts and written posts. Either way, he has something he is proud of, presented at the district TechnoExpo and in the process developed new contacts via his presentation. When the comments showed up on his blog to moderate… he was so excited he could barely contain himself, and now he is constantly planning his next post. Then there was Embug. This young lady is a worker-bee. She grasped hold of the philosophy of Genius Hour and embraced it with abandon. She is DEEPLY passionate about Greek Mythology. That is great… until you Google it. So what our Embug, little genius that she is, decided was to create a “kid-friendly” Greek Mythology website so that other kids that share her passion have a safe place to explore and learn about Greek Mythology. Now to some of you this may seem like an interesting task for an eleven year old. But for a dyslexic, this was a huge undertaking. You see, her eyes play tricks on her. So not only did she write all of the text in “pages” first before copying and pasting into the Wix website builder to help her self-edit due to the spelling challenges she faces. She also had to learn some basic HTML code. Now for those without the challenges of dyslexia the forward slash, back slash and every symbol in between can make a person go blind, so imagine if you were trying to modify HTML code and were dyslexic. What may have seemed too much trouble for some, was only another reason for her to push forward. She had her eyes set on a goal. Nothing, not even some difficult HTML code, was going to stop her achieve what she set out to do. She practiced multiple times in the mirror. Asked for critical feedback from her dad and I. And shared her passion with anyone that would listen, including a high school Mythology teacher that was so impressed that she got Embug’s information and plans to contact our gal to come speak to her High School Mythology Class. When she presented her website that night the room housed a small crowd, but every member of the audience was in awe. Young middle school men, planning to present after her, shook their heads in approval. Parents of other students were amazed at both the content and the savvy-ness of her tech prowess. She was a goddess of knowledge and expertise. We couldn’t be prouder of our two tech savvy kiddos pursuing their passions, and overcoming their own learning obstacles. I can’t wait to see what they do next.